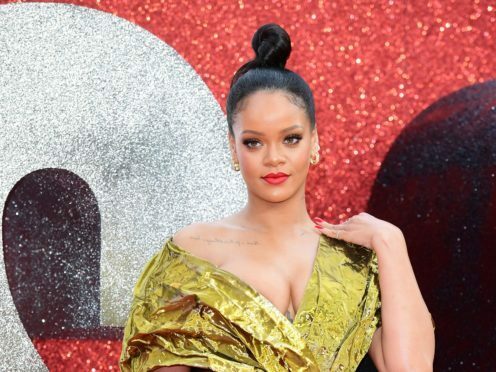 Rihanna turned heads as she arrived at the Ocean’s 8 premiere in a shimmering green-gold dress. All eyes were on the singer as she walked the red carpet in the stunning creation, which left one shoulder bare and a low plunge showing off the star’s assets. Rihanna’s dark hair was swept into a stylish topknot and she showcased her legs in towering heels. The singer was joined by co-stars including Sandra Bullock, Cate Blanchett, Helena Bonham Carter, Sarah Paulson and Mindy Kaling at the event at Cineworld, Leicester Square. Bullock looked far younger than her 53 years, lighting up the carpet in a stunning, sequinned culotte jumpsuit. Her brunette locks hung in waves almost to her waist, and she completed her look with strappy black sandals. Bonham Carter also selected something sparkly for the big night, dazzling in a long silver dress that featured a slightly asymmetric neckline. Her brunette curls were piled on top of her head and the actress accessorised with simple jewellery. Blanchett was her stylish self in black trousers, simple heels and an elegant, feathered long-sleeved top with a belt accentuating her slim waist. The actress had to share the limelight as she brought along her son as her date. Paulson made a statement in a fashion forward pale pink gown that fell to the floor in scalloped layers. The top layer fell over the actress at an angle, leaving her left arm bare but her right mostly covered. The star’s short hair was slicked back and she wore dangly earrings with pink jewels. Kaling was the picture of elegance in sophisticated black. Her figure-hugging dress featured a chiffon overlay which fell to the floor and long sleeves embellished with stunning silver detailing. The star’s black hair fell loose around her shoulders as she walked the carpet. The film follows Debbie Ocean (Bullock), the sister of Danny Ocean, played by George Clooney in Ocean’s Eleven, Twelve and Thirteen. She enlists a group of friends to pull off a daring heist – stealing the famous Toussaint diamond necklace from the Met Gala. Ocean’s 8, which also stars Anne Hathaway and Awkwafina, is released in UK cinemas on June 18.